When creating your app, user experience is always a major factor. However, many app developers don’t make it a big enough priority, and become caught up in assuming their idea and design works without actually factoring in true users’ experiences. So, here are 4 ways to improve your app UX. Don’t wait until your app is released to find out what you could have done better, take advantage of user-testing services, such as Verify, uTest, and UserTesting.com, to understand how users interact with your app and identify what’s missing. It’s important to test both your target user base, and niche targets so that you understand what different people are looking for. When acquiring feedback from your users, find out what task-based functions they want, what they aren’t using, and how the design could be improved. Don’t just identify what users like and don’t like, but truly understand why a certain process is complicated to them and, after making changes, test them again to see how much their satisfaction has increased. Make appropriate tweaks at every step of app, not just before you release the app or immediately after. The most successful apps consistently complete user testing and then re-test after each new update. #2: First impressions matter, so make set up simple. Today’s mobile users are crunched for time and are often turned off by complicated sign-ups or set-up instructions for mobile apps. Reduce log-in and set-up to as many steps as possible, and after a user has installed the app, be sure your app settings are easy to find to make the experience as customizable for users as possible. When it comes to notifications, sounds, and even log-in protocols, users want to have the ability to choose. 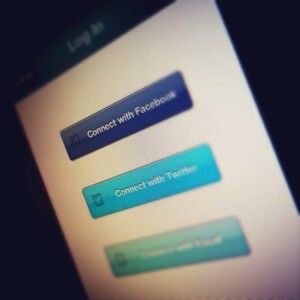 When designing your log-in/sign-up page, pay attention to making it both graphically appealing as well as easy. Additionally, pay attention to what you are emphasizing. It shouldn’t be hard for new users to know how to create an account, or for existing users to log in. 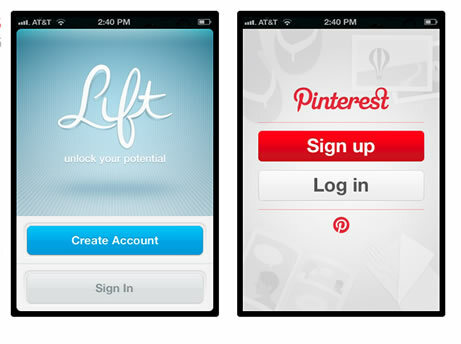 Lift and Pinterest offer great examples of simple yet easy log-in pages. Both highlight the option for new users to sign up or create an account, making it easy to attract and engage those who have not yet used the app. Another log-in option that works is to integrate sign-in with social media so users can quickly sign in with their social media accounts. 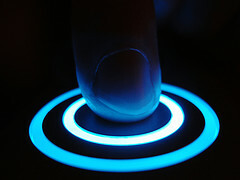 This also benefits users who don’t want to be bothered with multiple account usernames and passwords. Remember not to sacrifice simplicity for clarity. Always be clear with your users about how their information will be used. What does “user-friendly design” mean? It doesn’t just mean an intuitive interface (although that is always important). More than this, user-friendly design truly caters to your specific user base. What a tech-savvy teenager needs is most likely vastly different than what a rushed businessman or experienced gamer is looking for. So when you think of user-friendly design, think of user-appropriate design. Streamline your design to fit your target audience’s specifications. Remember, what you think is easy may not be for your users. So back to point #1 – feedback, feedback, feedback! In addition to making your app specific to your user base, there are some general design guidelines to follow, no matter whom you are targeting. Ensure your buttons and fields are size-appropriate. Platforms and fingers vary in size. Make sure your design is platform appropriate, or, if your app is for use multiple platforms, make sure that you have tested it on each platform. Mobile users are time-crunched and on-the-go, so don’t waste their time or screen space. Make sure your app has quick loading time, and cut the clutter so every bit of the screen is used effectively. #4: The bottom line? Think of the user! This may seem obvious and redundant, but it’s very easy to spend so much time on your app that you forget about how a user who has never seen it before will react. If your app is tied to a website or other program, don’t assume that all users will be familiar with it. Always look at your app as if you have never seen it before, and question every part of it with regard to simplicity, ease of navigation, and value. Although part of your app may well be simple to use, is it of true value to your user? Or, on the other hand, is a very valuable component in your app, simply very hard for users to locate? These are the most important questions to consider at every stage in app development. Ofer Yourvexel is CEO of WRNTY, a provider of mobile sales apps for catalog and order taking. His management experience spans the global high-tech and retail sectors.